IPE occurs in subjects with cardiovascular diseases as well as in healthy and apparently healthy subjects. Overhydration may create conditions for IPE to occur, even in healthy subjects. Similarly, negative-pressure breathing, which can occur in closed-circuit diving or in open-circuit diving with a faulty regulator, can result with acute flash pulmonary edema. Hypertension, even mild if not properly regulated, may predispose for IPE. In several reported cases, narrowing of renal artery was associated with IPE. Women experiencing premenstrual fluid retention seem to also be at an increased risk. Extreme psychological stress causing strong sympathetic arousal and a rush of adrenaline may cause IPE. Two characteristics of IPE must be kept in mind. First, the sudden evolution of difficulty breathing and coughing followed by a rapid lung flooding with fluid leaking from lung capillaries can quickly incapacitate diver. Diver must ascend to a surface, signal for help and be quickly retrieved from the water. Sometimes divers do not succeed to emerge and their death is later ascribed to drowning or other causes. Fortunately, in some divers IPE evolves slower and they survive. However, they do not necessarily recognize the nature of their symptoms until more severe episodes require them to go to the hospital. This constitutes the second major characteristic of IPE: It tends to happen again. Thus, a history of difficulty breathing while in water must be taken seriously. 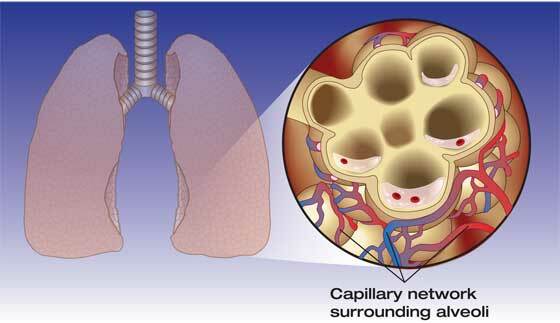 A diver experiencing such symptoms must be thoroughly evaluated for cardiovascular and pulmonary diseases. Regardless of the finding, return to diving is not advised in most cases. Some medications may help to reduce the risk of IPE, but this is considered only in those divers who must dive for a living. David Smart presented two fatal IPE cases in scuba divers. The main finding at autopsy was a froth filling the airways and a large increase in size and weight of lungs. These findings are not specific enough to distinguish IPE from drowning. The most important help in diagnosis is a thorough dive (or snorkeling and swimming) history, which sometimes reveals past episodes of breathlessness. Another case was presented by Sarah Lockley. Again, there was a history of breathlessness, coughing and cyanosis (bluish skin discoloration and the mucous membranes due to insufficient oxygen in the blood) while swimming that were disregarded until a tragic accident revealed the true nature of it. Divers and other individuals engaged in sports involving immersion must not leave any episode of respiratory issues unexplained. Surviving IPE once is a blessing, not a trend. Jim, while CPAP would be helpful, it is not a standard piece of first aid equipment on boats. Oxygen first aid helps. EMS that come to evacuate injured probably would have CPAP equipment and skills in applying it. I suffered IPE on a dive in lanzarote in december-13, the reason was a negative pressure breathing regulator, , i ascended when it started to be heavy getting air. On surface my lungs was full of edema emidiently. We was on wreck dive,luckily not deep ,24 meter. , i had to be transported back to the boat, and ashore ,whith ambulance to hospital. I had perspiration stop 5 minutes .as u write:surviving is a blessing,not a trend ..my guide luckily did mouth to mouth during tranportation to boat where i got oxygen. But it was still problems to make me breathing .i luckily survived. I hopefully can dive again(,if i dare).,since it was not my harth and lungs that coursed this, but the regulator,…if dive doctor aload me ,,have to do 6 months checking first. ,all the way DAN was supporting me during all those weeks i spendt in hospital i spain, they called me every day ,sometimes twice, That felt very good in that situation,Thank u DAN !! Very interesting article, and to be honest im a little surprised that such a “silent but deadly” problem hasnt gotten more attention. I have been a swimmer all my life, but i have also suffered (albeit mildly) from Asthma. Im no hypochondriac but this is definitely worth checking out with a diving specialist MD. Thanks for the insight!! I am in the trama ward in Los Cabos right now due to an IPE event yesterday. Very cold water to 100 ft for only 10 minutes when difficult breathing turned into an emergency ascent. Kept my cool and didn’t panic rising 1 ft per second with no safety stop. Almost out cold at the surface don’t remember getting on boat spewing pinkish foam. Ambulance to emergency very quickly and completely recovered in 10 12 hours. I was just surprised I never heard of this before.I may never dive again, after doing nearly 100 dives. I am 59 and in very good shape so this was a major surprise to me. We are taught to handle most emergencies but not this from within our bodies.